I actually saw this idea in the hotel lobby and fell in love with it because it contains both the beauty of the white sand and the shells. We brought three peanut butter sized jars of white sand home with us: one jar went to a coworker, and the other two went inside this cylinder vase. 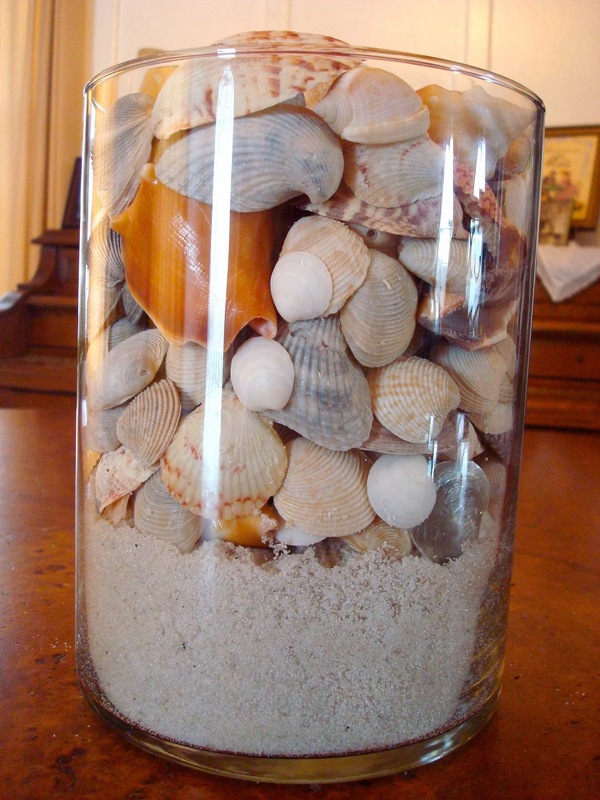 Then I layered my seashell collection on top of the sand. 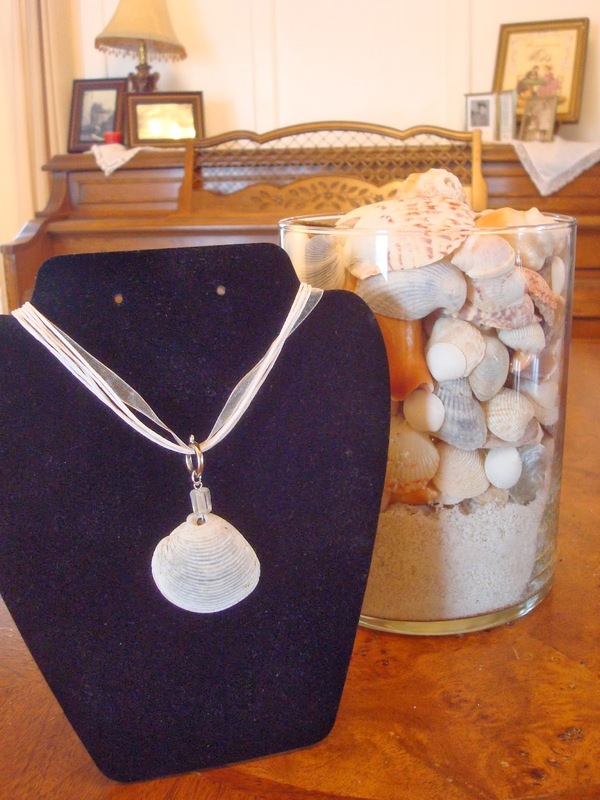 Wa-la: I have a beautiful remembrance of my time on the beach and I didn't buy it in a gift shop! I put the vase on my dining room table. I use to have fake pears in this vase. I like the shells so much better. This sand dollar was my special treasure. We kept finding lots of broken sand dollars on the beach, but I could never find one completely intact until my last day of vacation. I squealed with delight when I found this fragile beauty. We also found lots of shells with holes in them and thought they would perfect for making jewelry. It took me awhile to figure out how to attach it to a necklace and still look halfway decent, but I like what I came up with it. I simply took a eye pin and threaded it through the hole on the shell and two beads (one bead on the outside and one on the inside of the shell.) Then I twisted the pin into a knot on the bead inside the shell to keep the pin attached. A small jump ring was then put through the eye pin, and a large jump ring was threaded through the pre-purchased ribbon necklace. 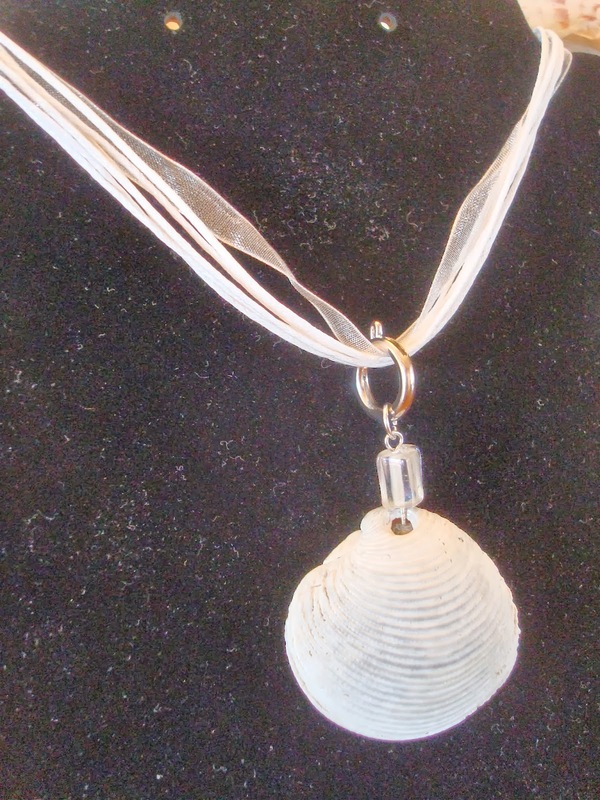 Every time I wear my shell necklace, I think of my special times I spent on the beach. It helps get me through the cold, difficult days, weeks, and months of winter. 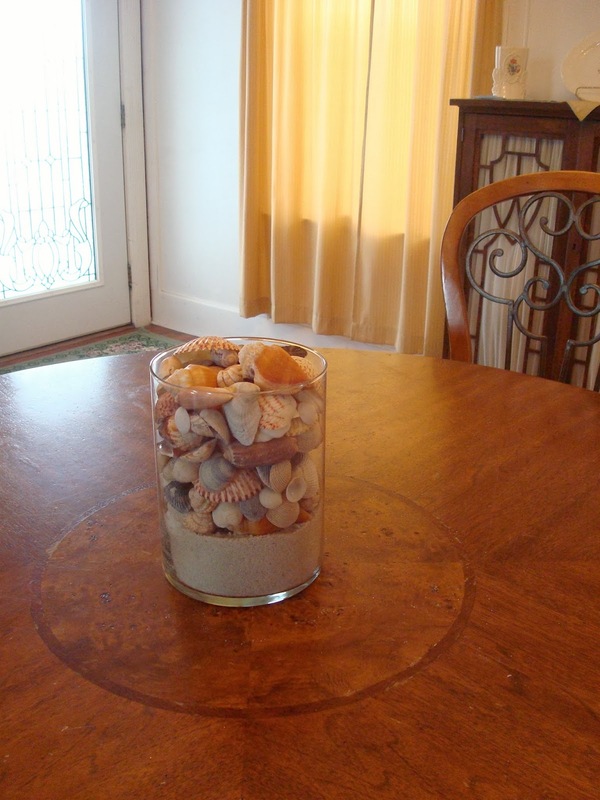 Such great ideas Amy, especially love the vase with sand and shells! And of course the necklace is so beautifully done too! Oh superb ! Love all ! very nice ideas !